A total of 333,600 tonnes of greenhouse vegetables have been harvested in Russia since the start of the year, according to a report on Russian site Fruit News. That figure represents an increase of 40.4 per cent over the same period in 2017, with the biggest increases seen in cucumbers (23.6 per cent), tomatoes (51.9 per cent) and other vegetable crops (53.4 per cent). The huge increases are the result of sizeable investments made in greenhouse production since the Russian ban on EU produce was introduced in 2014, with considerable support from the government. The ultimate aim is to make Russia self-sufficient in most items of fresh produce, as it currently is in just onions, carrots and beetroot. This has required significant investments in Dutch technology, which itself has increased Russia’s self-reliance. The Russians are now able to build up to up to 200ha of greenhouses each year, with 95 per cent of all processes performed by Russian companies themselves, according to Dutch horticultural fair GreenTech. 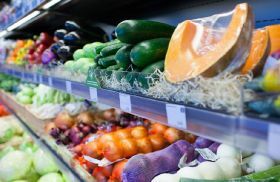 Fruit News revealed that the leading production regions for greenhouse vegetables were in Krasnodar (27,700 tonnes), Moscow (23,200 tonnes), Stavropol (21,900 tonnes) and Volgograd (19,800 tonnes).